You are here: Home / ICI/PRO Community / Featured Studios / Meet Biggest Loser Winner Pete Thomas! Meet Biggest Loser Winner Pete Thomas! Joe Ducosin in the middle of Biggest Loser contestants O'Neil Hampton, Pete Thomas, Sunshine Hampton and Jessie Atkins. ICI/PRO member Joe Ducosin invited Amy and me to a special event at Cycle Quest Indoor Cycling Studio, Joe's new studio in Eden Prairie, MN. The event was a kick off for the Minnesota Tour de Cure, a fundraising ride for the American Diabetes Association. 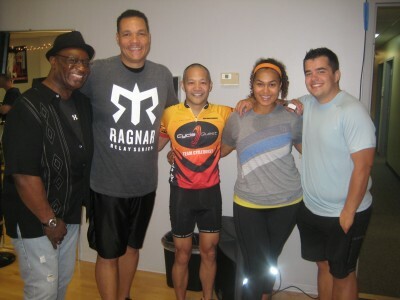 It featured Biggest Loser contestants O'Neil Hampton, Pete Thomas, Sunshine Hampton and Jessie Atkins. All four are very inspirational and Amy and I thoroughly enjoyed meeting and riding with them. During the break between the two classes held that evening, I had the chance to talk with Biggest Loser season 2 at home winner Pete Thomas and convince him to be a guest on a future episode of the Indoor Cycle Instructor Podcast.